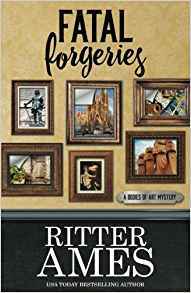 I’ve read the entire series of A Bodies of Art mysteries and, while I enjoy the series, I felt that “Fatal Forgeries” left a little too much up in the air at the end of the book. The story lines of the preceding books generally solve a smaller crime while leaving an other-reaching and larger crime or criminal activity left unsolved. I am used to this type of scenario, especially in British television mystery series. The problem with this book is that none the lesser crimes were solved. This is a really cute coloring book of Kawaii girl designs by Jade Summer. There are 30 different designs (with 2 copies of each design for a total of 60 coloring pages.) The designs are quite detailed and some contain small areas to color. The designs; however, are not what I consider intricate and difficult to color. The word Kawaii is Japanese for cute. The girls in this book are definitely cute and have a kind of manga style about them. They are more mature than the girls in Jade Summer’s Chibi Girls coloring books but still have large eyes and lots of fun personality. There are so many girls in different scenarios, including: princess, witch, mermaid, scientist, Native American, school girl, angel and much more. The designs do not merge into the binding. There is a heavy framing line at the outer edges of the design to give the project a more finished look, especially for framing. 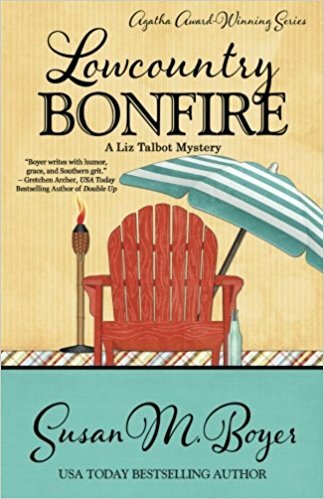 I am a real fan of Susan M. Boyer’s Liz Talbot mystery series. 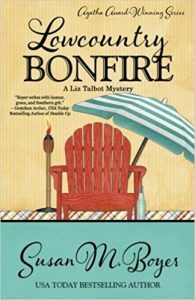 The latest (“Lowcountry Bonfire”) is another great entry in the lineup. In this story, the paranormal touch is lighter than in many of the other books. Coleen, who is the ghost of Liz’s best friend from high school, has been warned off helping Liz and her husband Nate too much. For that reason, she is less involved in this particular story but there is a promise of more coming in future books. This is a coloring book of 22 bird designs based on the artwork of artist Molly Hashimoto. The drawings are uncolored block prints which have big, bold black lines. The designs are quite bold in concept with the birds as the main focus but with full backgrounds as well. Included on the inside of the front and back covers are full color thumbnails of all of the original artwork. The title of each design is listed not only on its page but also on a contents page at the beginning of the book. The contents page also gives the size of the original artwork, the medium in which it was done and also the date it was finished. The designs are easy to color but with a heavy use of black which is very prominent due to the nature of block prints. I prefer to use my markers with this style of design and accent it with colored pencils. I find that some shades of pencil are apt to be seen on top of the black as a grayish tone if I accidentally color over it. Designs do not merge into the binding area and have a distinct finished edge which acts as a frame and an ending point for coloring. Colored pencils work well with the paper. It has a slight roughness to it that allows good pigment coverage from both oil and wax based pencils. I was able to layer the same and multiple colors well and could blend easily using a pencil style blending stick. As I mentioned previously, some colors look gray if they are used on top the heavy use of black in the designs. This is a coloring book of 22 animal designs by artist Jill Mayberg. One of my favorite styles of coloring designs is folk art. These designs have that vibe. From the blurb in the book, Ms. Mayberg appears to use mixed media in order to create her original artwork, including photographs, drawings, paintings and even cut-outs. The results are charming, both in the original artwork and in the coloring book designs. Included on the inside of the front and back covers are full color thumbnails of all of the original artwork. The title of each design is listed not only on its page but also on a contents page at the beginning of the book. The contents page also gives the size of the original artwork, the date it was finished and that it was done in mixed media. No further detail is provided as to which media was used. The designs are open and easy to color. While some designs contain small areas to color, I don’t consider the artwork to be intricate and difficult to color. Designs do not merge into the binding area and have a framing line at their outer edges. 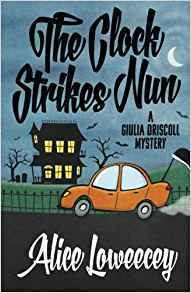 This is the latest entry in the Giulia Driscoll mystery series. Giulia is a former nun now turned private investigator. In this book, this series makes a left turn into a somewhat paranormal adventure. There is still a mystery to solve but other forces are added in as you go along. This is one of a new series of Make Your Own Art Masterpiece coloring books from Flame Tree. In this coloring book, the artwork of Vincent Van Gogh is explored. The designs in this book have a lot of detail which can be sometimes intimidating. In this book, some of detail lines suggest areas for shading. There are 45 line drawing designs to color. The designs were chosen by Daisy Seal and were illustrated by David Jones. The designs cover a good range of Van Gogh’s artwork. It’s amazing to think that such a wonderful and popular artist only sold one painting during his lifetime. On the opposite facing page of each design, is the name of the work, when it was created and how it was published. There is a thumbnail of a small portion of the design with some color showing. The inside flaps at the front and back of the book have black and white line drawings which can be colored as well. The cover is quite smooth but will accept various forms of color medium. 45 Designs based on the artwork of artist Vincent Van Gogh. Paper is light ivory, heavy weight, slightly rough and is perforated. Sewn Binding. You can remove pages at the perforations if you wish but it will separate the designs from the describing thumbnails. Book fairly easy to lay flat in the open position. The designs do not merge into the binding area. The designs have framing lines at their outer edges so you don’t have to color up to and over the edges. Alcohol based markers bleed through this paper. India ink pens can leave slight shadows of color on the back of the page. Water based markers and gel pens do not bleed through the paper. Coloring pencils worked well. Both oil and wax based pencils worked well for providing good pigment. Though the paper is slightly smooth, I was able to layer the same color for deeper tones, layer multiple colors and to blend easily using a pencil style blending stick. If you use a medium that bleeds through the paper, I suggest using a blotter page under your working page. I use card stock but heavy weight paper works well, too. This will keep ink from seeping through and marring the pages below. I will attach a silent video to this review of a page by page flip-through so you can decide for yourself if it suits your needs. I’ll also attach some sample photos of the pages as well. In this latest coloring book by Marvel in their Color Your Own series, Spider-Man is the character whose comic series is highlighted. The coloring book contains the associated characters from the series that I would hope to see. There are also mock-up pages from the front of comic books and even pages which include dialog boxes. The designs are highly detailed with small and intricate areas to color. The designs are done by a large group of individuals. Interestingly, though there are many different styles represented, the book is still a great cohesive presentation of the series. There is a heavy use of black in the designs which doesn’t bother me but may be an issue for others. Colored pencils work well with the paper. I tested both oil and wax based with good results. I could get good pigment due to the rough tooth of the paper. I could layer the same and multiple colors easily and blend well using a pencil style blending stick. Hard lead pencils can leave dents through the paper. I use and suggest others use a blotter page behind the working page (if you don’t remove pages from the book to color.) I use card stock but a couple of sheets of heavy weight paper work well, too. This is one of a new series of She Said It Best coloring books from by Kimma Parish. In this coloring book, the wit and wisdom of Dolly Parton is explored. While most of the quotes are from statements she has made over her career, some are quotes from her songs and movies. Ms. Parton is a no-holds back kind of lady. It comes through in her words and in her music. The quotes range from very funny to sincere to slightly sad but true statements. She is a real go-getter and is not shy about letting others know. I’ve had the pleasure of seeing Ms. Parton on stage at the Grand Ole Opry and her performance was the highlight of my husband and my trip to Nashville. It’s wonderful to have this book to remind me of that great concert and all the pleasure I have had from her music and performances over the years. While some of the designs are directly related to the applicable quote, not all are that specific. They are appropriate to the overall subject with cowgirl boots, microphones, and high-heel shoes among them. The format of the book is smaller at approximately 8.5 x 6.25 inches. It makes it easier to carry if you wish to work with it on-the-go. As the book is sized down, it does make for some small and intricate areas to color. On the whole, I would not categorized the book as intricate; however, it does have a nice amount of detail on most of the designs. 61 Designs based on the quotes by Dolly Parton. Paper is white, medium/heavy weight, slightly rough and is perforated. Glue Binding. You can easily remove pages at the perforations if you wish. Book fairly easy to lay flat in the open position by creasing/breaking the spine. The designs do not merge past the perforations. If you use a medium that bleeds through the paper, I suggest either removing the pages from the book before coloring or using a blotter page under your working page. I use card stock but heavy weight paper works well, too. This will keep ink from seeping through and marring the pages below. This is one of a new series of She Said It Best coloring books from by Kimma Parish. In this coloring book, the wit and wisdom of Jane Austen is explored. While most of the quotes are from her books, there are also a few which are derived from her personal correspondence. While, in many cases, the words are from a character, you can see the wonderful humor and insights of the author that make the works of Ms. Austen as fresh and fun today as they were when she first wrote them. I am a real fan of her books, having first read them when I was in grammar school. I re-read them often and each time I find something new and delightful. 61 Designs based on the quotes by Jane Austen.